Cold Dark Winter in the Big Apple! Being an army brat, my dad always had a collection of Tom Clancy novels lying around the house while I was growing up and most of the action movies of the time were the adaptations of his novels as well. But my first video game exposure to Tom Clancy came in the form of the early Rainbow Six games on PC like Rouge Spear and Raven Shield along with the Ghost Recon series as well. Since the Tom Clancy games were taken over by Ubisoft, that’s where we saw the release of the hugely popular Splinter Cell series, along with newer versions of the Rainbow Six and Ghost Recon franchises release as well. 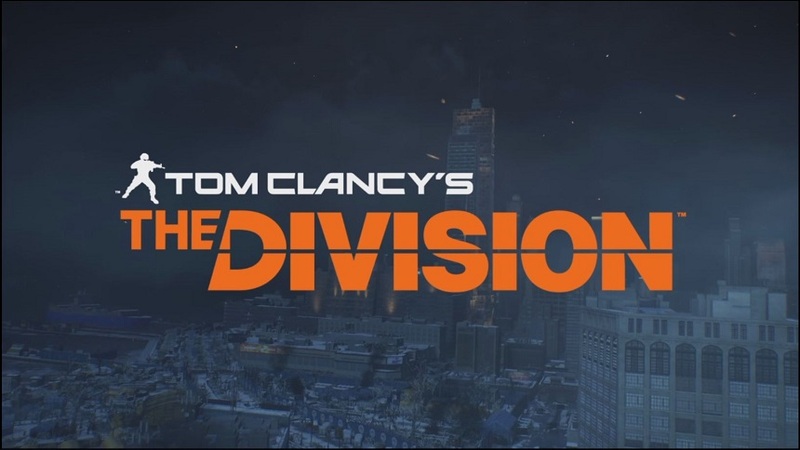 All these games being military based shooters you might think that the new game Tom Clancy’s The Division might be around the same lines. Though you might be correct on the military shooter part, The Division changes things significantly in terms of structure for you to believe that this isn’t just a typical 3rd person shooter. It’s open world loot-driven shooter that seamlessly blends in online multiplayer Co-Op like an MMO. Let’s find out more about the game and what I thought about my time with The Division, the long overdue review. 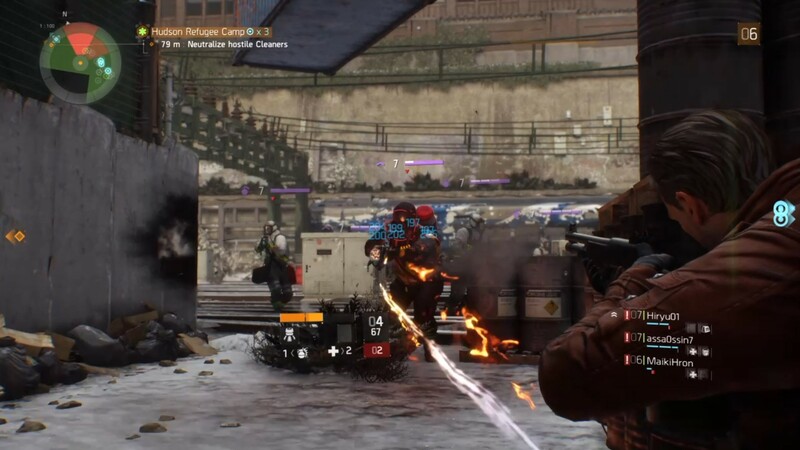 The Division is set in a post-epidemic New York City namely Manhattan where a new version of the deadly Small Pox virus was spread by terrorists through money during a shopping sale to devastate the population. The city goes into chaos, looting and pillaging is getting out of control, that’s when the military and other services like fire and police departments made a Joint Task Force to battle the gangs and factions that sprang up in the aftermath. This is where you come in, as a sleeper agent of a secret government agency called THE DIVISION, you are called back into action to help put things back into order. 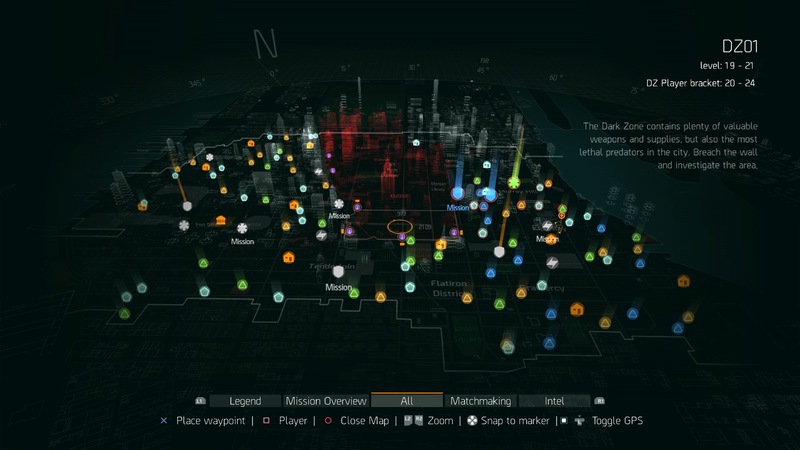 The opening moments of The Division is where you are given the back story and briefing of your initial goals and first notice the games departure from other Tom Clancy games, being basically an online RPG. This is where you first get to create your character by picking your gender, basic hair & facial features (nothing too detailed), before you set out in the big bad world of the big apple. You eventually make your way to your Base of Operations which serves as your hub area, this is where you’ll interact with NPCs (non-playable characters) and other human players in the world, this is also where you must build up the 3 wings of the base which tie into the missions and the gameplay. The MEDICAL, TECH, and SUPPORT wings house the main character NPCs that you will be meeting for all your story related missions. 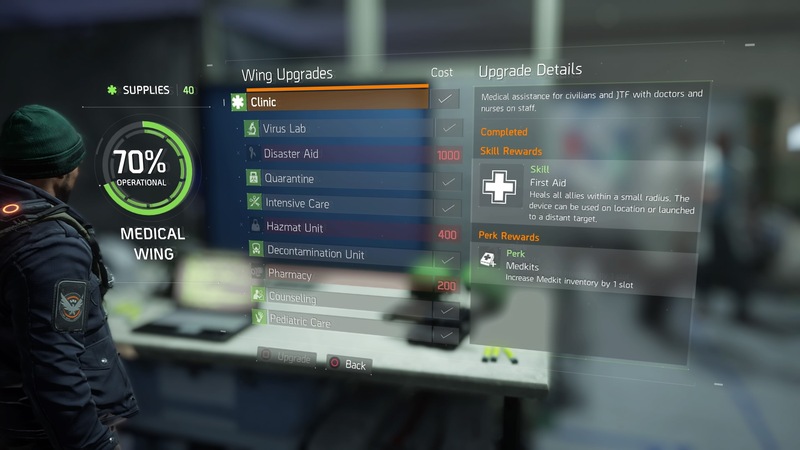 Each wing has an in-charge that gives you story missions, completing them gets points which you spend on upgrading the respective wings, points spent upgrading each wing opens up your inventory with skills and talents which you can unlock and assign to your character, from sentry turrets and seeker mines that find and attack enemies to radar pulses and portable shields for protection, the easily swappable skills and talents are a big life saver in tough situations. So basically, The Division is an online Open World RPG Co-Op Cover Based 3rd person shooter similar to Gears Of War in gameplay with just enough Tom Clancy flavor to it to make it work, and when it does work its pretty nice. Just like the newer Splinter Cell and Ghost Recon games you can run from cover to cover by holding down a button, which makes getting in and out of cover in tough situations a breeze. But for some reason the game has the lack of a crouch option, which is a weird omission, that means it’s essential to be in cover to avoid any sort of enemy fire. Enemies consist of gangs and factions of people with weapons ranging anywhere from baseball bats and shields to flamethrowers and machine guns, this makes the different factions stand out from each other by look and the way they attack, but mostly consist of the same enemies repeating, with no real big stand out enemy types between the various factions that you’ll encounter. 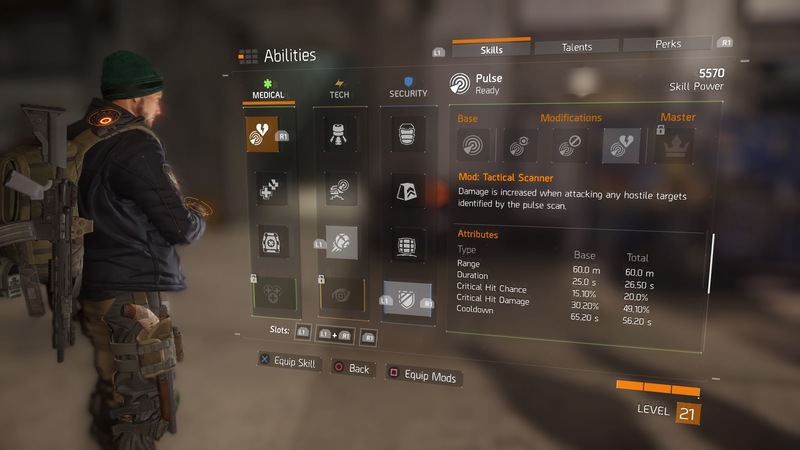 But unlike other shooters in this genre, The Division changes its formula to a loot driven online Co-Op shooter with RPG elements, where enemies drop their loot in the form of inventory items like armor and weapons of various varieties and potency depending on their level. Which is very similar to the recent games like Destiny by Bungie or The Borderlands series or even like an MMO like World Of Warcraft. Whereas those games were set in worlds with aliens, monsters, magic and energy weapons, the game design decisions made sense. But when you have human bullet sponge enemies who take obscene amounts of damage to take down in a realistic world setting, that can really take you out of the experience as it becomes weird that it takes you multiple shots on the enemy’s head just to take him out. Speaking of experience, the world that The Division presents to you is significantly different compared to the lively open worlds that you might see in games like GTA5. 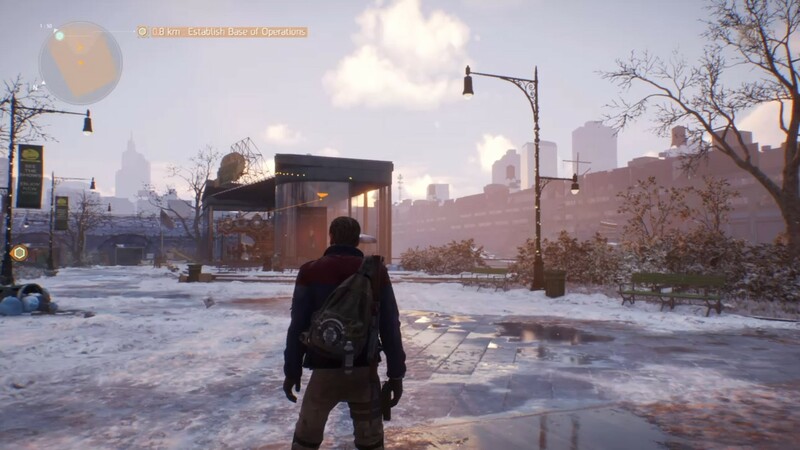 It’s what makes The Division’s world a bit different, as you can explore the devastation caused by an outbreak of this deadly magnitude, you see the problems that follow with it, like an barely populated barren world. But that was the point that the environment artist was trying to make. 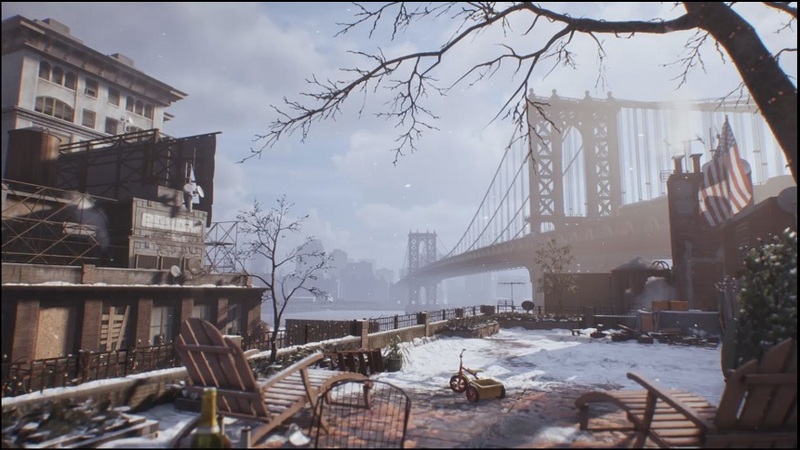 The Division shows a bleak view of the devastated New York, with the tall skyscrapers and landmark bridges rendered in absolutely stunning detail. The painstaking effort put into the environment’s look of a destroyed, post-apocalyptic, cold, bleak world that has been ravaged by the disease shows, and it really puts you into a world where people are struggling to survive. The look of destroyed beauty is the best way to describe it. 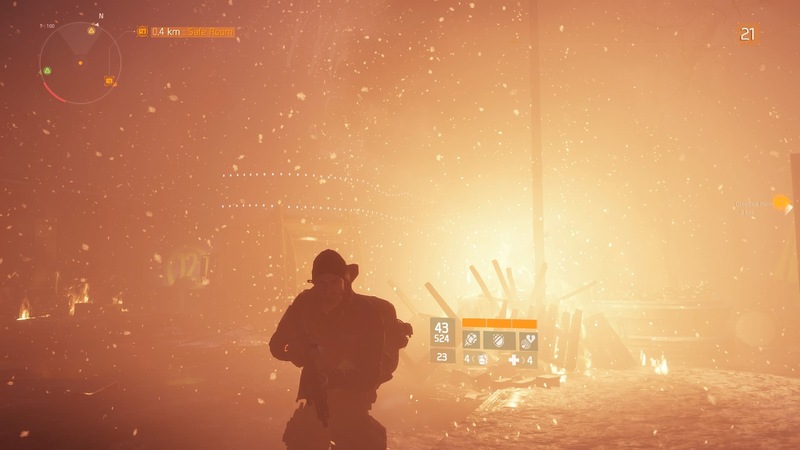 The Division is a very pretty game with a full day-night cycle and a cold weather system with heavy snowfall sometimes. Effects like smoke, fire, explosions and the lighting are some of the best out there in recent times and offers you a realistic experience. That being said the world is devoid of things to do, besides the story missions and rare random enemy encounters, you unlock safe houses in the open world that become your fast travel point to the location and also unlocks the various side missions in the area. Apart from repeating the handful of similarly styled missions, there’s nothing much to do but walk all the way to another safe house in another region and repeat the process. It would have much better if the world had some other activities too besides the usual collectibles, repeating side missions and widespread random encounters with enemies. It doesn’t lack content, it just doesn’t have enough variety in the content that there is available. Even though playing with a group of 3 other friends (which is really the best way to play this game) was awesome fun, the process got old after a while because besides leveling up to meet the requirements of the next story mission, the sad gear dropped by the enemies wasn’t much of an incentive to play those types of side missions again and again either. 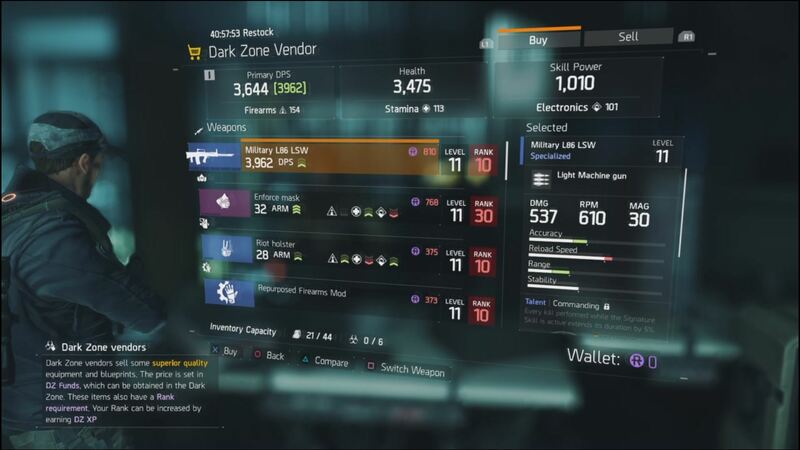 But if you want the best gear you need to go to the DARK ZONE, which if you manage to grind your way to the end game that is rank 30, you will have finally the option to brave. 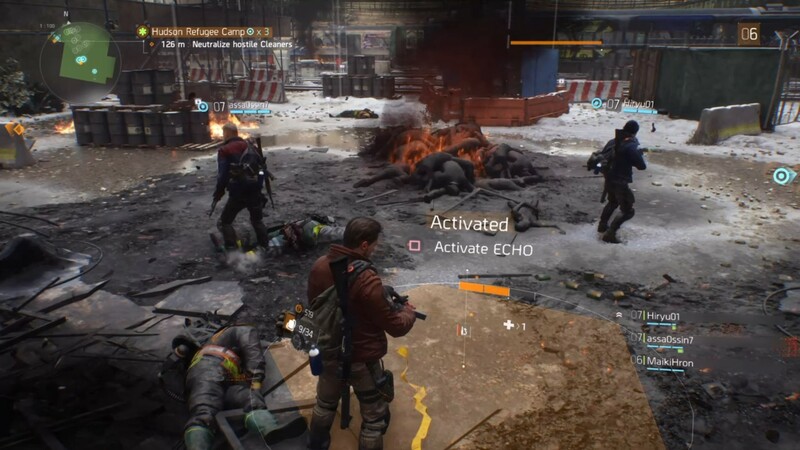 The DARK ZONE in The Division is the central part of the city which has been walled off because of rampant infection, with martial law in effect and every man is for himself, it’s basically a no man’s land. 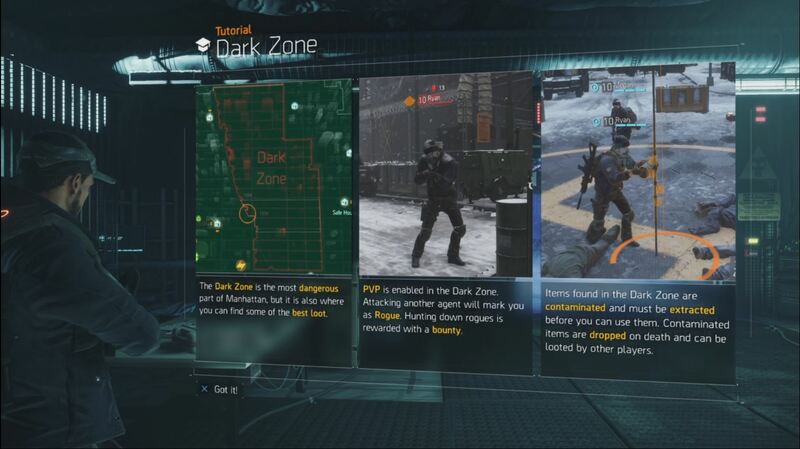 The DARK ZONE serves as the Player Vs Player arena for The Division with its own separate ranking system and gear. Where in the normal game you’ll never randomly run into another player in the open world, besides the team you joined up at the safe house, here you can randomly run into other human players and can either work together to survive against the elite enemies, or try to kill each other to take whatever loot the others might have scavenged. 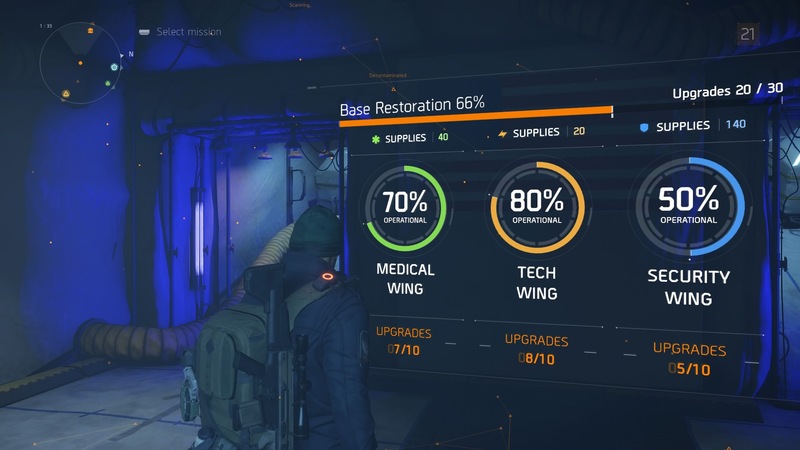 But unlike the outside, the loot you pick up in the DARK ZONE is contaminated and must be extracted out with a chopper, made available later at your Home Base after it’s been decontaminated and safe to use. The tension during when you call for the extraction is always high, after you signal the chopper you have to defend your position for a few minutes till it arrives while all nearby enemies and players are alerted to your position and want to kill you and steal your loot. If you do shoot at other players who are also division agents that makes you a ROUGE agent, this puts a bounty on your head for all the players to come and collect for a huge reward. You can do the same with other rogue agents as well. This amounts to a risk/reward gameplay, do I grind it out as much as possible in the DARK ZONE to get the best gear only to be shot and have it all stolen and losing my rank at the same time? or do I try to get someone on my side to work together to make it through with least amount of risk? Sometimes the risk isn’t worth it but other times the thrill of the experience when you finally get that high-end gear secured is pretty exhilarating, even high jacking someone else’s loot while he’s extracting is just as satisfying if not more. 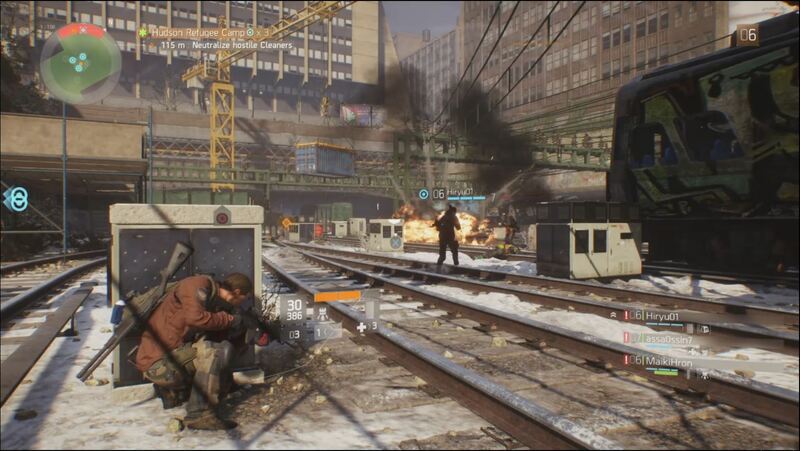 The Division as the name suggests is going to be divisive, some will love the moment to moment Co-Op gameplay, others might think it’s too monotonous after a while. But the real issue comes with the game’s longevity coming into question. It being an online multiplayer shooter Ubisoft wants you to be playing it for as long as possible in the coming months, which in its current state seems unlikely. They seem to want to address that issue with a new update coming on April 12th that will add some significant changes in the form of Incursions, which are The Divisions new Co-op Raid missions. That should add some more things to do when you eventually hit that endgame. There are also significant changes which are made to loot and the DARK ZONE which are coming soon, so we have to wait and see. But as the game stands right now it’s a good solid feeling 3rd person shooter with interesting mechanics and fun co-op experiences, but after the initial fun of the opening hours and story missions, it becomes just a monotonous grind, which we are hoping will change in coming update.